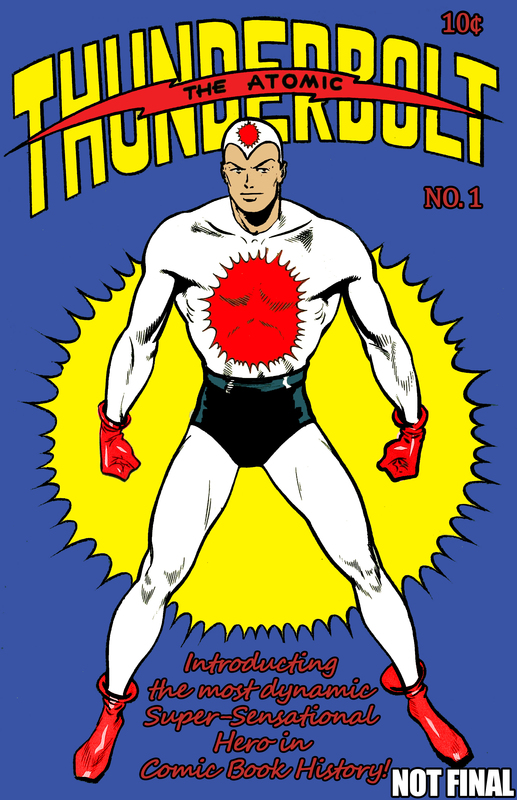 TJ Comics is proud to announce the long-awaited return of the greatest one-hit wonder in all of comics – The Atomic Thunderbolt! IPPY Award winning writer Kevin Powers teams up with talented newcomer Matt Gaudio and colorist Donna Gregory to revive this classic Golden Age hero. The atomic age hero made his first and only appearance in “The Atomic Thunderbolt #1” in 1946. Featured in two stories – one detailing the character’s origin and the other in a slapstick tale with two aloof scientists – The Atomic Thunderbolt disappeared and was never seen again in mainstream comics. In the 70 years since his initial publication by the Regor Company, The Atomic Thunderbolt has achieved a cult status among Golden Age and Public Domain superhero enthusiasts. One of the more unique aspects of character is the year he was created. Following the debut of Superman in “Action Comics #1” in June 1938, every publisher under the sun created characters like the Man of Steel in an attempt to capture that same lightning in a bottle – especially during World War II. Some of those characters have endured, while others have faded into obscurity. The Atomic Thunderbolt came after the height of the early-1940s superhero craze. The war was over, the Cold War had yet to begin and many superhero comics had begun to cease publication while the precursors of Marvel and DC continued to evolve. 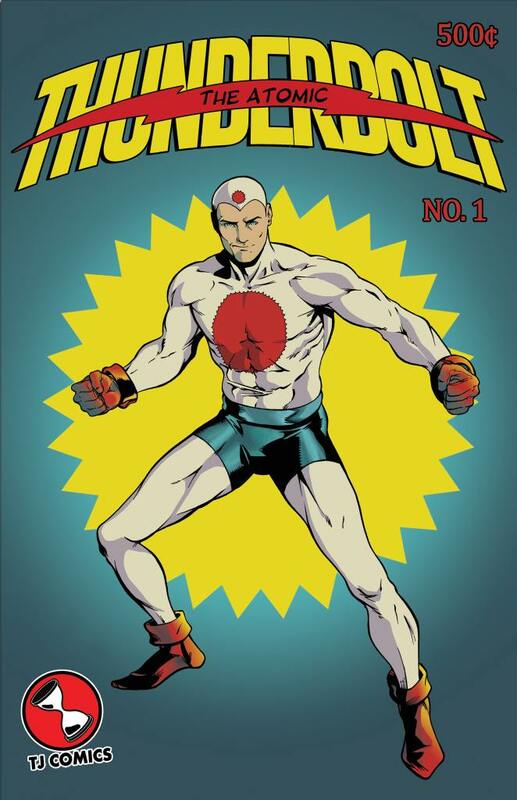 This summer/fall, TJ Comics will release a brand new “The Atomic Thunderbolt #1” that continues the story of the original and sets the stage for further adventures. The sensational first issue will contain 30 fully colored pages of story bringing the titular hero back to life. In addition to the standard cover by series artist Matt Gaudio, TJ Comics will debut its first series of variant covers for this first issue including a re-mastered version of the original, a variant by the incredible Lord Mesa and more! Following the release of the first issue, TJ Comics will follow the success of “Patriot-1” and “The Argonauts” and launch a Kickstarter campaign to raise funds to produce an all-new, original story entitled: “Whatever Happened to The Atomic Thunderbolt?” The story will pick up following the events of the first issue and reveal what really happened to not only The Atomic Thunderbolt, but many other superheroes of the era. Each chapter will be broken into four issues, digitally released, before being collected into one edition that includes the first issue. 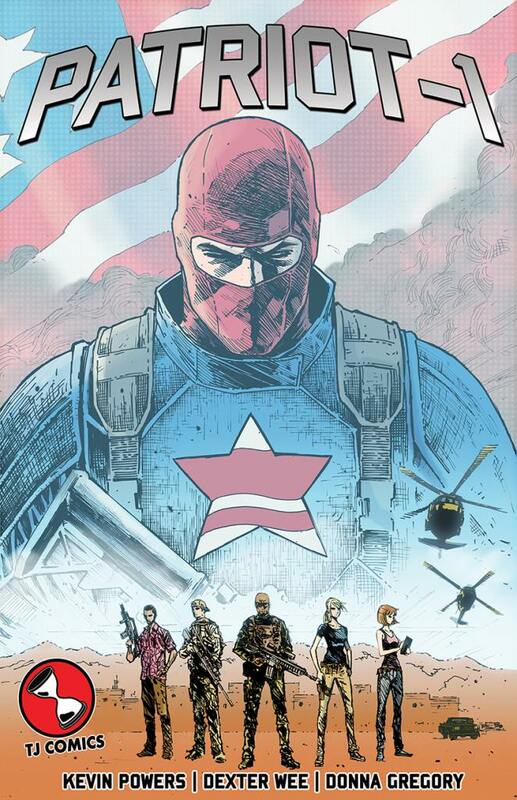 Although the story will stand alone, it will also serve as a precursor to TJ Comics’ ExtraOrdinary superhero universe. The campaign will feature an exclusive variant of the first issue as well as a number of other exclusive rewards and incentives. Follow TJ Comics on Facebook and Twitter to keep up with all the latest updates on the project including previews, release dates and more! TJ Comics’ first story of our webseries TJComics.com Presents is well underway. The first story, Shard’s Lesson tell a tale outside of the main Argonauts title and presents a focused look at Shard, offering insight into what makes him tick, the perfect supplement to The Argonauts. 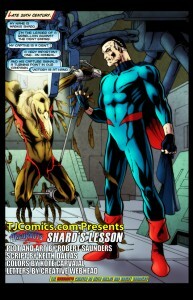 Updated every Monday and Thursday at 12 Noon, TJComics.com Presents: Shard’s Lesson is a quick way to escape the woes of the week and step into an alternate world! Mack Turner: Slayer of the Dead Returns With a New Look! Following an unfortunate delay, Mack Turner: Slayer of the Dead returns this summer with issue #4! The issue picks up right where issue #3 left off with Mack apparently suffering his demise after General Horn ordered the destruction of a zombie-infested school. Finally, Mack and company return with new artist Chandra Kelly. Chandra is a very talented artist who brings a new style to the series, while retaining the same spirit as original artist Israel Gonzalez. Series creator and TJ Comics publisher Kevin Powers found Kelly’s art amongst submissions for The Argonauts. Kelly will remain on the title until it’s conclusion. For more, visit the official Mack Turner page! IDW Publishing has released their September 2012 solicitations featuring the Ghostbusters Omnibus which includes a tale co-written by The Argonauts creator Keith Dallas. In 2010, Dallas and co-writer Jim Beard teamed up with Josh Howard and took the Ghostbusters to comic-con. The one-shot was met with a great deal of critical acclaim and is currently difficult to come across in standalone form. • 3 Full length graphic novels in one volume! The book is available for pre-order on Amazon. Check out The Argonauts page for more by Keith Dallas.